How wisdom seekers evolve through creative discontent. Some time ago I read an article about Richard Avedon’s stroke, hospitalization, and passing. The famous portrait and fashion photographer had a stroke at age 81 while he was on assignment for The New Yorker. The news provoked a reflection on one step taken from the egocentric path toward the spiritual path; it sent me time-traveling back to 1968, when I was focused in photographic modeling and assisting my first husband with his commercial art studio. Back then, even though I knew that Avedon photographed an array of beauties, I associated his name with Jean Shrimpton’s. The Shrimp was my idol. Hers was the face that captivated me, especially in an Avedon photo that appeared in one of the magazines I scanned at the time—it may have been Vogue, or even Seventeen. I studied that photograph in detail, especially with an eye for the drama created with Avedon’s backlighting technique. His model seemed to have magically appeared in the midst of light. How I wanted a picture like that for my portfolio. I showed it to Bill Wolfhagen—photographer, friend, and my husband’s studio mate. In his Scandanavian accent Bill said, “Let’s do it.” We teamed up to produce our own version of Avedon’s vision. The night before, I labored to curl a platinum wig, take a few stitches in a borrowed dress, and rehearse the makeup. We ended up with a portfolio photo that was my favorite. Only now, at the passing of Richard Avedon, does the picture take on quite a different meaning of personal significance. The result of our work wasn’t a picture of me. It was a consciously contrived illusion. It was a visual metaphor for what we do every day in this earthly existence. The recollection of that year, 1968, now inevitably links the photograph with J. Krishnamurti’s writings, because it was also during that year when my attention was arrested by Krishnamurti’s face and voice on the TV screen. I set tasks aside to sit, to listen to him. I had joined the ranks of wisdom seekers. That was the start of my immersion in Krishnamurti’s talks—the teacher who advocated creative discontent; who said, “You can see that everything about you is decaying, being destroyed. This so-called civilization is no longer being held together by the collective will; it is going to pieces.” Excellent reminder for me, that one day good cheekbones will be a small vial of ash. Photograph of Lily by Vilhelm Wolfhagen. 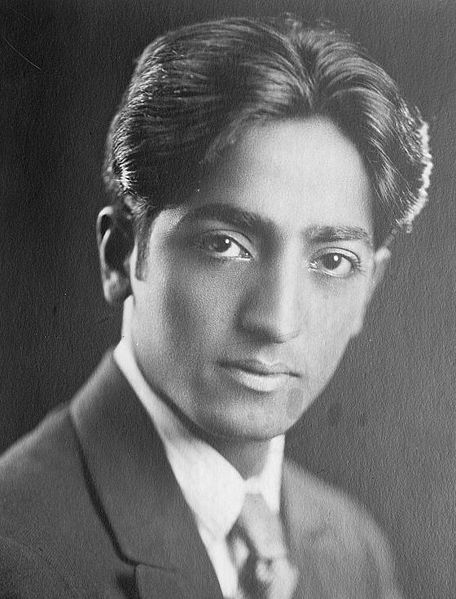 Photograph of Jiddu Krishnamurti from Wikimedia Commons. Quotations from Think on These Things, J. Krishnamurti, Perennial Library edition by Harper & Row, 1970, pp. 52, 98.